Today, Jenni's prompt was to show some love to a blog friend. To that I say, what exactly do you mean by friend? Because this blogger that I'm loving right now, Fran, well, we're not friends per se. We have conversed on twitter and instagram -- is that what makes a friend these days? -- and we apparently share a love of the movie Center Stage (but, let's be honest, who doesn't love that movie and reference it as often as possible?). Fran is a flight attendant, and basically I'm asking if by friend, you mean someone that I don't know, but would chase through the largest airport maze possible (think Hartsfield-Jackson*) to say hi. I'm not going to post a picture of Fran, because that would just be creepy, so instead I'll post pictures of that time Ike and I went to the park to watch the planes. I may or may not be extra alert in airports, hoping for a Fran sighting. Anyway, Fran is funny in a way that you can tell she's not even trying, a talent I would love to have. She makes me laugh in every post and tweet -- even when she's trying to be serious. Also, I think we both understand the art of using caps to convey excitement. In this world of communication by typing, finding someone who has a compatible caps to non caps balance IS A HUGE DEAL, PEOPLE. reading Let's Explore Diabetes with Owls, by David Sedaris. On deck: The Round House, Beautiful Ruins, In the Garden of Beasts, The World's Strongest Librarian, and I've secretly been dying to read this. Also, Curtis Sittenfeld has a new book coming out soon! I adored Prep and American Wife. 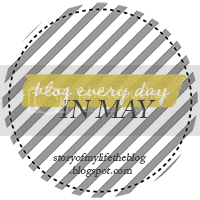 writing every day in May. What's great about it is that usually the prompt will make me think of of two or three things, so I've got post ideas stockpiled for miles. listening to -- even though I feel like a giant cliche saying this -- the Great Gatsby soundtrack streaming on NPR's first listen. I CAN'T HELP IT, OKAY. I just want Baz Luhrmann to direct my life and create its soundtrack. That would be a really great contest, by the way, which I would totally enter: send Baz Luhrmann the story of your life, best one gets to have him create its soundtrack. If it ended up being The Elephant Love Medley over and over, I would be okay with that. thinking about how my best friend and I actually stood in front of Moulin Rouge and sang The Elephant Love Medley. I was that kind of tourist in Paris. See? smelling granola. For some reason I decided to bake three kinds of granola yesterday. Don't tell me you've never had that kind of Saturday. hoping that I win that imaginary contest I just made up. wearing my favorite, softest shirt. loving the new addition to our bar. Our next door neighbors disassembled an old piano and put it out by the trash. We grabbed a piece and now we have ourselves a piano bar. wanting to read outside on our new little setup. It's 39 degrees right now, but rumor has it we'll hit 70 today! feeling grateful that my friend Sarah sent me this scarf she knit just in time for the TWO snowfalls we've had so far in May. They're over, though...right?!?! clicking These blogs I found through Jenni's challenge: The Dirt Life, The Nectar Collective, Big Mario Life. Shay's video about Grey's Anatomy cracked me up. And this gif is my new favorite gif in the history of gifs. And as always, Lauren! Share your sunday currentlies over at siddathornton. *Fran, totally trying to impress you with my knowledge of airport names. **I don't know the official name of the Memphis airport, but it's gross so I don't think it deserves my knowledge.